MOOG Protokraft fiber optic transceivers consist of optoelectronic transmitter and receiver functions integrated into a range of connector interfaces. All components are designed for use in harsh environments where small size and weight reduction are valued. 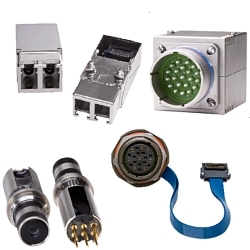 Cutlass series D38999 transceivers consist of optoelectronic transmitters and receivers functions integrated into a wall mount D38999 cylindrical connector. Direct 9 series D-Subminiature optical fiber transceivers consist of optoelectronic transmitter and receiver functions integrated into a printed circuit board mounted D-Subminiature / ARINC 801 compliant receptacle connector. Razor series fiber optic transceivers with duplex LC interface consist of optoelectronic transmitter and receiver functions integrated into an surface mounted PCB assembly with a duplex LC connector interface. Stiletto series optical fiber transceivers consist of optoelectronic transmitter and 10 Gbps receiver functions integrated into a pluggable Duplex LC compliant connector.